Slithering in at 48 feet long and weighing an estimated one-and-a-half tons, the largest snake the world has ever seen is being brought back to life. Sixty million years ago, in the mysterious era after the mass extinction of the dinosaurs, scientists believe that a colossal snake related to modern boa constrictors ruled a lost world. With exclusive access to what one scientist called “a once-in-a-lifetime discovery,” Smithsonian Channel(TM) will tell the extraordinary true story in TITANOBOA: MONSTER SNAKE, a two-hour special premiering Sunday, April 1 at 8 p.m. ET/PT. The startling discovery of Titanoboa was made by a team of scientists working in one of the world’s largest open-pit coal mines at Cerrejon in La Guajira, Colombia. It is a snake that dwarfs the largest anaconda found today, and it has the size and character to challenge T-Rex in the public’s imagination. The story behind this significant scientific revelation began in 2002, when a Colombian student visiting the coal mine made an intriguing discovery: a fossilized leaf that hinted at an ancient rainforest from the Paleocene epoch. Over the following decade, collecting expeditions led by the Smithsonian Tropical Research Institute and the Florida Museum of Natural History, University of Florida opened a unique window into perhaps the first rainforest on Earth. Fossil finds included giant turtles and crocodiles, as well as the first known bean plants and some of the earliest banana, avocado and chocolate plants. But their most spectacular discovery was the fossilized vertebrae of a previously undiscovered species of snake, one so large it defied imagination. Together with their research teams, Jonathan Bloch of the Florida Museum of Natural History, University of Florida and Carlos Jaramillo of the Smithsonian Tropical Research Institute, joined forces with one of the world’s foremost experts in ancient snakes, Jason Head of the University of Nebraska, to unlock the mysteries of this ancient time and discover exactly how Titanoboa appeared, lived and hunted. The fossilized remains revealed that, after the extinction of the dinosaurs, the tropics were warmer than today and witnessed the birth of the South American rainforest, in which huge creatures battled it out to become the planet’s top predators. 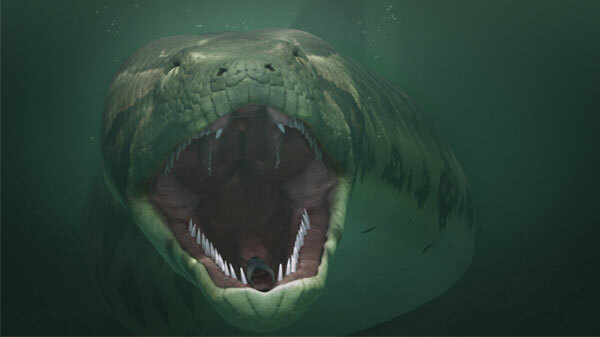 Dominating this era was Titanoboa, the undisputed largest snake in the history of the world. Most of the fossil record of ancient snakes is comprised of vertebrae like the one that launched the Titanoboa investigation. Snake skulls are almost never found as they are extremely fragile and usually disintegrate – making it almost impossible to create a full and accurate picture of these extinct creatures. But during the filming of TITANOBOA: MONSTER SNAKE, the scientists managed to uncover not just one, but fragments of three skulls, allowing them to derive for the first time what this ancient giant looked like. 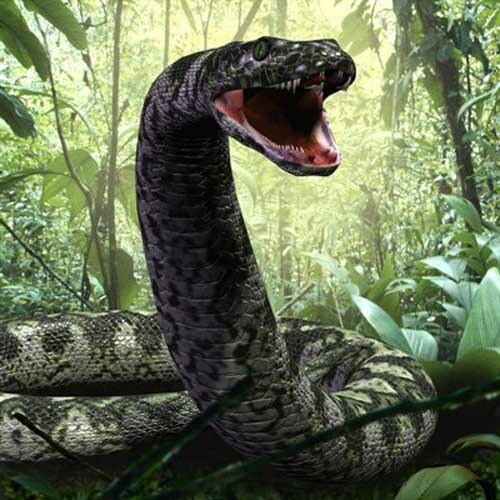 A scientifically accurate, life-sized replica of Titanoboa appears in the film and will go on display for the first time at the National Museum of Natural History beginning March 30, 2012. The exhibition will travel to museums across the country beginning in fall 2013. Titanoboa: Monster Snake is a collaboration between the Florida Museum of Natural History at the University of Florida in Gainesville, the University of Nebraska-Lincoln, and the Smithsonian Tropical Research Tropical Research Institute, and is circulated by the Smithsonian Institution Traveling Exhibition Service. The two-hour special explores how this monster snake would have lived by visiting its living cousins, boa constrictors and anacondas, in the Florida Everglades and the Venezuelan Grasslands. The scientists’ research yields some intriguing and terrifying insights, including the climate in which it lived and size of the snake. All of these clues come together to paint a picture of Titanoboa’s world, which is brought back to life in stunning CGI. Here we see how the colossal snake ruled as an ancient apex predator among a land of tropical mega-beasts. TITANOBOA: MONSTER SNAKE follows the scientific sleuths back to the mine, into the labs, and on an expedition to understand modern giant constrictors. It creates a picture of the then largest predator on the planet – a creature that until now has only populated fiction and nightmares, but can finally be displayed as a marvel of nature.